Lance Cpl. Jedidiah Morgan, jumps a low wall rather than walk around it, bypassing a potential IED choke point during a patrol with 2nd Squad, Third Platoon of Baker Co., 1st Battalion, 7th Marines. 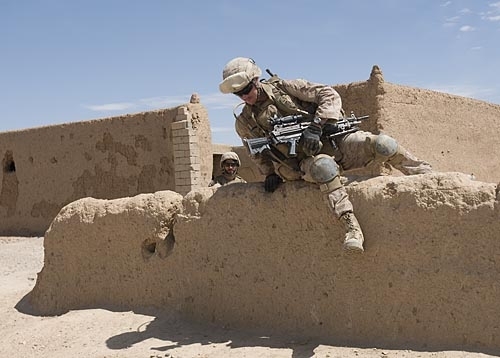 The unit operates out of Patrol Base Fulod, in the “Fishbowl” section of Sangin, an area that has been historically dangerous due to it’s high walls, and narrow alleys. PB Fulod in Sangin, Helmand on May 01, 2012.